The Israeli military, in an effort to block Hamas naval commandos from infiltrating Israeli territory via the sea, destroyed an underwater terror tunnel, the Israel Defense Forces (IDF) said on June 10. The IDF said the tunnel was destroyed in an Israeli airstrike on June 3. The IDF said its navy knew about the tunnel for several months and it was decided it was the “right time” to destroy it. “The tunnel, which was operational but did not actually extend into Israeli waters, would have enabled terrorists who would enter from a Hamas military post in the northern Gaza Strip to exit into the sea unnoticed, making it possible to carry out terrorist acts from the water,” the Jerusalem Post reported. The IDF said the underwater tunnel, which reached a depth of two to three meters, was three kilometers (1.8 miles) from the border with Israel. To counter Hamas infiltration by sea, Israel’s Defense Ministry in May began construction on an underwater barrier which will stretch from the southern Israeli community of Zikim into the Mediterranean. 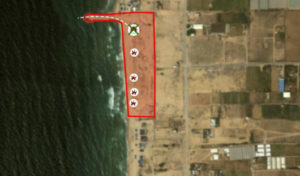 “The decision to build the naval barrier was decided upon after five Hamas frogmen tried to infiltrate Zikim during Operation Protective Edge in 2014 armed with automatic weapons, fragmentation grenades and several types of explosives devices. They were engaged and killed by the IDF in a combined attack from the sea, ground and air,” the Jerusalem Post report said. “This is the only obstacle of its kind in the world, which will effectively block the possibility of infiltrating into Israel via the sea, and this will further thwart Hamas’s strategic capabilities,” said Israeli Defense Minister Avigdor Liberman.